Clif Family Winery was founded in 2004 in St. Helena, California. Owners Gary Erickson & Kit Crawford are focused on hand-crafted wines that sustain the natural resources of the local community and bring awareness of organic and sustainable farming to others. The fruit for our estate wines comes from our vineyards located high atop Napa Valley’s famed Howell Mountain appellation. We also source fruit from small, family-owned vineyards in other regions of the Napa Valley and Mendocino. In 1992, when we started Clif Bar & Company, we were driven by our passion for food and adventure and a desire to create convenient, portable and above all delicious food for today’s busy lifestyles. Several years later, in 1997, we moved with our family to the Napa Valley. What started as a home in the country soon developed into a wonderful adventure in winemaking and a deeper commitment to sustainability and farming. Today, on our Food Alliance- and CCOF-certified farm we grow a variety of fruits and vegetables that make their way to our Clif Family Bruschetteria food truck, and our preserved fruit and vegetable products. For our wines, we source our fruit from some of the best vineyards in the Napa Valley and Mendocino appellations, working with growers that have demonstrated a commitment to the environment and sustainable farming of their land. Our Cabernet offerings come from our organically farmed Howell Mountain estate vineyards. Our goal is to craft unique, regional wine and foods using practices that care for the earth and to support growers who use sustainable and organic farming methods. In this way, we can contribute to a more vibrant and healthy food community. We hope that as you discover our products, Clif Family becomes a part of your own adventure, reminding you to slow down and find pleasure in everyday life. You can experience our wines at the Clif Family Tasting Room on Main Street, St. Helena during your Napa Valley adventures. The Clif Family Tasting Room is a unique place where the passions of cycling and wine are celebrated and blended. We offer a variety of wine and food pairing experiences, customized bicycle rides, espresso and an electric vehicle charging station. Our outdoor patio is the perfect venue for a glass of wine and post ride celebration. One of our signature dishes is our succulent porchetta bruschetta. Sustainably farmed at Long and Bailey Farms in Manteca, California and stuffed with organic fennel and herbs from our farm, it is the staff favorite. Although you may find us traveling throughout the Napa Valley, we are most at home just off the back patio of our Tasting Room, Tuesday through Sunday, 11:30AM – 4PM, extended hours on Wednesday until 730PM. To join the wine club, visit www.cliffamily.com or call 707-968-0625. With a passion for food, we craft all our wines to be food-friendly and highly enjoyable. We produce just 8,000 cases of wine annually, which you can find only at our tasting room, through our wine clubs and at select Napa Valley restaurants. The fruit for our estate wines comes from our CCOF certified organic and Napa Green Certified vineyards located high atop Napa Valley’s famed Howell Mountain appellation. Our viticulture and winemaking team strive to achieve balance, structure, varietal character and richness while also protecting our environment and our community. We release twelve small production bottlings a year that include Rosé, Sauvignon Blanc, Chardonnay, Viognier, Grenache, a Red Rhone Blend, Zinfandel, a Red Bordeaux Blend, Petite Sirah, and three Howell Mountain Estate Cabernet Sauvignons. Our wines range in price from $26 to $110. 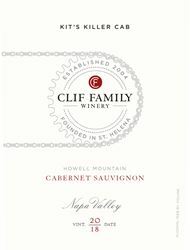 Clif Family has many clubs to choose from based on your preference ranging from a Food and Wine club, a Howell Mountain Cabernet Club and a Cycling and Wine Club to name a few. Please contact wineclub@cliffamily.com for more information. Clif Family Winery is certified under the Napa Green Winery Program by the Napa County Department of Environmental Management (DEM) and the Association of Bay Area Government’s (ABAG) Green Business Program and completed all the regulatory components needed for environmental sustainability. These components included developing water and energy conservation methods, preventing pollution, and reducing solid waste. In addition to developing sustainable winery practices, this program is set to become the standard for the state of California. Clif Family Winery is certified under the Napa Green Certified Land Program. Clif Family Winery has created and implemented a customized farm plan with measured results that addressed all aspects of its property, vineyard land as well as non-farmed land, including practicing soil conservation, water conservation, stable drainage, riparian corridor enhancement, fisheries and wildlife habitat enhancement and long-term improvement and sustainability.